“The Unnatural and Accidental Women” reimagines the murders of 10 middle-aged Native women by a serial killer in Vancouver during the 1980s. Clement’s titling of the play draws attention to the problematic reporting of the Native women’s deaths- the coroner’s reports found the deaths “unnatural and accidental”. A dramatization play, The Unnatural and Accidental Women was written by Vancouver playwright Marie Clements and performed in, among other places, Buddies in Bad Time Theatre in Toronto (2004). In the play, the writer focused on the story of the victims in an attempt to redress the failure of the news media to do so. 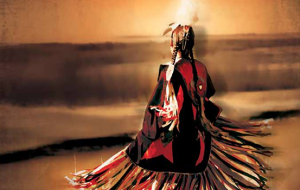 Clements confronts the complacent depiction of missing and murdered Aboriginal women by highlighting racist stereotypes and profiling of Indigenous women that perpetuates violence against Native women. The play asserts an important call for social action with the reimagining of the Downtown East Side (DTES) largely portrayed as an uninhabited wasteland, dehumanizing the Native and non-native women living in the poorest region of the city. This flip book serves as a visually engaging experience for the reader to delve deeper into the themes of violence against women, colonization and gentrification Clements unravels throughout the play. As you navigate through the pages of the flip book, you will notice various hashtags drawing attention social, political and humanitarian issues. Indigenous peoples ways of life and existence are inaccurately confined to relics of the past to convenience the colonial narrative. Effectively engaging with various social media platforms (Twitter, Facebook and Instagram) enable messages independent of colonial influence to be conveyed through differing mediums, connecting to a wider audience and redirecting the narrative. The use of hashtags have become vital forms of communication reimagining how people engage across various mediums. The hashtags implemented throughout the flip book connect to news and protests or marches related to indigenous issues. For example, hashtags relate to the annual march for missing and murdered Aboriginal women February 14th in the Downtown East Side. All sounds for this project were recorded on foot in the DTES, unless otherwise stated. Throughout the play, Clement sets the scene with sound descriptors. You will find in the flip book, we have incorporated the sound bytes accordingly. 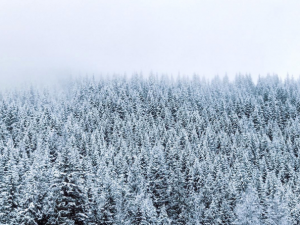 The excerpt above describes the sounds of trees falling in the forest, you will find this sound and others linked in the flip book to assist in the creative, immersive reimagining of the play script. 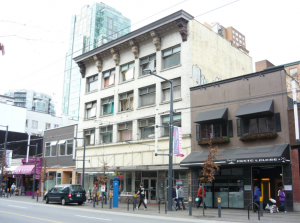 On the fourth page of the flip book, “Keep on walking… down Hastings Street” you will read an excerpt from the script of Rebecca’s thoughts as she is walking down Hastings street. The sound byte leads you to a recorded sound clip from Hastings Street- you hear muddled conversation and city sounds while reading Rebecca’s thoughts. You feel like you are walking alongside her. 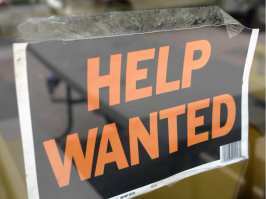 A “HELP” sign advertised in the window to a passerby may read simply as a need for employees whereas for Rebecca, it triggers thoughts and emotions she is experiencing whilst searching for traces of her missing mother. Various interpretations for the message conveyed through this medium of a help sign advertised in the window are brought to attention on this page of the flip book. The fifth page of the flip book details the scene from the script of Marilyn sitting in the Barber’s chair. The reader is hyper aware of her fate as she engages with the killer. She is alone with him. The page includes a photo of an alley in the DTES with the hashtag #AmINext? 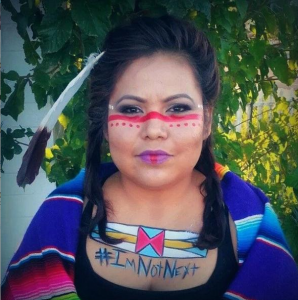 A hashtag that went viral bringing awareness to the crisis of missing and murdered aboriginal women. Included on this page is a link to a sound byte of sounds heard while sitting in the alley. Little to no conversation is heard. The sound illicit a feeling of desolation. The sixth page of the flip book, ‘The Barbershop Quartet 2’ includes an excerpt from the script detailing the Barber’s prowess to killing Indigenous women with alcohol poisoning. On this page, the sound link allows the reader to hear the Barber’s laughter (sound clip from the DVD version of the play). The seventh page of the flip book, ‘The Barbershop Quartet 3’ recounts the scene of Penny trying to escape with help from the ghosts or spirits of the deceased Indigenous women killed by the Barber. Throughout these scenes, the women’s braids are chopped off prior to their murder- symbolizing the defamation of their Indigeneity by the Barber. The purple globe icon in the bottom right corner links to a news article reporting the grizzly killings by the Barber and his release from jail. The sound clip links to an excerpt from the play – you hear a woman explaining ‘he sees himself as the hunter and you as the animal’. The inclusion of this sound clip emphasizes the dehumanizing effect the crisis of missing and murdered Aboriginal women has had upon Indigenous peoples. A photo clipping from a newspaper detailing the gruesome killings of the Indigenous women. Hashtag #NationalInquiryNow to emphasize a call to social action to pressure the Canadian government to launch a national inquiry into the crisis of missing and murdered Aboriginal women. The lack of appropriate media coverage and attention by the Canadian government is an intentional ‘white out’ of critical information reflecting the violent racism towards Indigenous peoples. The Soundcloud icon allows the reader to listen to the sound scissors cutting hair. This sound is important to setting the scene, albeit a bit gruesomely, the sound presumably prelude the killings of the Indigenous women. On this page, we include an excerpt from the script of Aunt Shadie leading the women in song, beneath the coroner reports of the three murdered women to confront the dehumanizing narratives and identities that are problematic with mainstream media reporting of missing and murdered Indigenous women. The introduction of song positions the women to a role of empowerment, using language and ritual as they ‘gather their voices’ to grow in strength. ‘Room #23, when you’re 33- Clifton Hotel’, this page draws attention to the problem of displacement that is exacerbating violence against Indigenous women. The purple globe icon on the right side of the page links to a news article on protests surrounding gentrification in the DTES. The twitter icon at the bottom right corner of the page links to the official account of the Standing Rock Sioux Tribe. Displacement and destruction of the land threaten the survival of cultures, traditions and Indigenous knowledge systems that are essential to revitalizing community dynamics and a stronger sense of self to assist in the prevention of Indigenous women vulnerability to violence. The hashtag #StolenSisters positions Indigenous womanhood in a prevalent, modern medium. The sound clip allows readers to listen to a scene from the play where the man from the dresser, which we can interpret as western societal judgement, degradingly identifying the Indigenous woman as ‘Pocahontas’. The mirror of THE DRESSER starts to reflect a man’s face” verbal degradation, repositioning the Indigenous woman to be seeking approval from an inanimate object or as it is revealed towards the end of the scene, a man. This page is incredibly symbolic of the stereotype and pressure Indigenous women experience by mainstream, westernized society. Indigenous women’s bodies are sexualized, their spirit belittled to objectification of an exotic ‘animal’ (Clements plays on the theme of hunter vs. animal with the barber). This objectification of Indigenous women not only makes them vulnerable and susceptible to violence, as seen with Clement’s recount of true events, but also inhibits the level of reporting dedicated to the crisis of missing and murdered Aboriginal women. The crisis of missing and murdered Aboriginal women throughout Canada exemplifies the incredible opportunity exploring alternative technological mediums provides in garnering global attention when the Canadian government and news outlets cannot be relied upon for accurate and thorough coverage these issues deserve. The Dresser attacks the woman, or western and colonial conceptions of Indigenous women, ending her life. A sound clip allows the reader to hear an ambulance recorded driving along hastings street on the DTES. An image of a dresser taken from my bedroom. The engagement with the dresser is also symbolic- this is where people go to retroactively change their appearance by dressing in different clothing that day. The cause of violence the character experiences in the book is reflected in this scene with the emphasis of perception of image and identity upon Indigenous women. 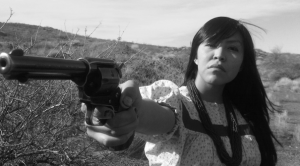 From “Apache Chronicle,” Lynnette Haozous as Lozen, the famed Chircahua Apache woman warrior who rode and fought with Geronimo’s band of renegades. Clement’s reimagines the outcome for the murderous Barber with Rebecca discovering his true identity and ending his life. Hashtag created, #Justice. The sound clip is of Aunt Shadie from the play telling Rebecca how the Barber behaves as a hunter does to an animal. This scene signifies the importance and resilience of Indigenous women in protecting one another and sharing knowledge. The women are reunited and restored to their natural state it seems, with their hair flowing, no longer in possession of the Barber. In the end, Rebecca became the hunter not the animal. #StartHealing and the end of the Barber ends our flip book. Shown is the Survivors totem pole in Pigeon Park; a pole that represents healing, reconciliation, and justice that is still needed. It also honours survivors of the DTES and issues commonly faced, including gentrification, colonization, racism, and poverty (CBC News, November 5, 2016). Songs were sung after the raising, just a song was sung after the Barber was finally killed. Themes of sadness, but also strength and the beginning of a healing journey are linked to these two images. We chose to depict the closing scene of the play with imagery of womanhood, and a sense of a tight knit community, reflecting Clement’s sense of community in the play with the murdered women joining together to support Rebecca. This message of strength among Indigenous women is a message often left out of mainstream media platforms and news reporting, facilitating the victimization of Indigenous women. As you interact with the last couple of slides in the Flip Book you see two scenes: a scene from the play of the murdered women coming together and second, women marching together to raise awareness for the Missing and Murdered Aboriginal Women. A sound clip encases the listener with the sounds of women talking, connecting and supporting each other. n Clement’s other works, she challenges how Aboriginal women are typically marginalized by showcasing their perspectives as a way to reclaim the screen and portray what really happened, something the media has failed to do. The goal is to reflect the realities of Aboriginal women as strong loving leaders and knowledge keepers, allow viewers to rethink their beliefs, and trigger new conversations through visual sovereignty and thinking outside of the box. The goal of this project is to reflect the realities of Aboriginal women as strong loving leaders and knowledge keepers whilst allowing viewers or readers to rethink their beliefs, and trigger new conversations through visual sovereignty and new communicative mediums. INDIGENOUS SCREEN SOVEREIGNTY SOLD HERE! David Gaertner on INDIGENOUS SCREEN SOVEREIGNTY SOLD HERE! alexandra wikler on INDIGENOUS SCREEN SOVEREIGNTY SOLD HERE!